Air leaks can be uncomfortable, maybe even frustrating, and they also may cost you money. According to EnergyStar.gov, you can potentially save as much as 10 percent on your total energy bills each year by properly sealing and insulating your home. Here are some tips to help get started. Check for obvious issues. You’ll need to identify these less-obvious air leaks to help make an impact on your energy bills. The Department of Energy (DOE) says you can do that yourself, with a careful visual inspection inside and out: Look for gaps and cracks at the common points of air leakage (i.e., knee walls, dryer vents, outdoor faucets, attic hatches, sill plates) and pay close attention to the building envelope — the outer walls, doors and other openings of your home. Take notes of any cracks, gaps or other openings, so you can return and air-seal them later. Get a professional inspection. 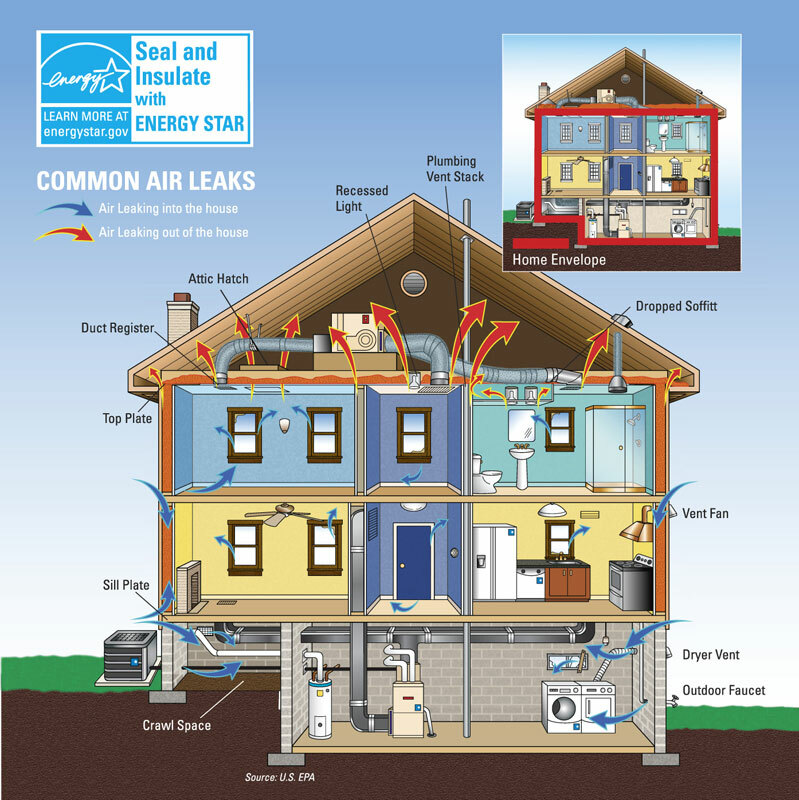 Of course, you can also hire a professional to help identify air leaks by performing a home energy audit, says the DOE. Typically, the process includes a blower door test, where a powerful fan is mounted to the frame of an exterior door. The fan pulls air out of the house, lowering the pressure inside, and allows the higher outside air pressure to flow in through cracks and other openings (the professionals typically use something called a smoke pencil, similar to the smoke test outlined above, to help spot the culprits; a blower door test not only locates air leaks but can also assess the overall air tightness of your home). Some energy companies and local and state governments offer free energy assessments and recommendations to help make your home more energy efficient, so if that’s something you’re interested in, contact your local energy supplier or state public services, says the DOE. Now that you’ve found your home’s air leaks, it’s important to get familiar with the tools of the trade. Caulk and spray foam are designed to help seal up stationary materials and fixtures like window frames (EnergyStar.gov recommends using caulk on holes 1/2 inch or less and spray foam on holes 1/2 inch to 3 inches). Weatherstripping is meant for items that move, like doors and operable windows (between the frames and sashes). You might also need a few specialty materials, like high-temperature caulk, metal flashing and reflective foils, depending on the project. One important thing to note: Air sealing may inadvertently cause a different problem, trapping indoor pollutants like radon or carbon monoxide and creating an unsafe situation inside your home. EnergyStar.gov says you should consider bringing in a professional to test for radon and to check whether heating appliances are sending out potentially harmful gases — both before and after doing any air sealing; he may recommend ventilation fans to help maintain safe air quality in your home. So, where to begin? EnergyStar.gov recommends prioritizing projects based on the biggest opportunity for comfort and savings. Attics. At the top of the list is your attic. Don’t worry about finding all the little gaps and cracks, EnergyStar.gov says. Focus on sealing up the largest holes first, because that’s where you may realize one of the biggest energy savings. An attic air sealing project might include creating pouches of fiberglass insulation to plug open stud cavities and gaps behind knee walls. You can also use reflective foil to cover soffits and fit aluminum flashing on the openings surrounding your furnace and water heater flues. Basements and crawl spaces. From there, your next savings opportunity may come from tackling the basement and crawlspace, where sealing air leaks can help prevent cold floors and reduce drafts from below. A basement air sealing project might include using spray foam or caulk to seal cracks and openings in the basement walls, ceiling or floor. You may also want to seal along the gap between the sill plate and the foundation and at the bottom and top of each rim joist (where cement walls meet the wood frame) at each end of the house. Don’t forget to also seal the openings for gas, water and electrical lines, ducts and wiring that pass to the outside (like your dryer vent). Larger holes might need pieces of insulation to help cover them. Doors, windows and walls. Though leaks in doors and windows may likely result in your most noticeable drafts, sealing them has the smallest impact on your energy use, according to EnergyStar.gov. But, because these areas are readily accessible and the solutions tend to be simple, they offer an opportunity for a simple do-it-yourself job that may result in minimizing obvious uncomfortable drafts. A door or window air sealing project might include rolling self-adhesive weatherstripping (felt, vinyl, rubber or silicone) down the side of a window or installing a door sweep to help seal the gap between the bottom of the door and the threshold. You can also apply plastic over windows and fit inexpensive foam gaskets (found at most hardware stores) behind electrical outlets on perimeter walls. Whether you do these draft-stopping projects on your own or hire a professional, once you’re done, don’t forget to sit back and enjoy that extra warm feeling that only comes from saving some money on your energy bills.